The winner of the second year of the Dionýz Ilkovič Award, Ľubomír Konrád, teaches physics at the same gymnasium in Žilina, in the same classroom, where he himself started three decades ago. He devotes much of his spare time to students in the club, where he prepares them for various physics competitions. Over the past 10 years he has helped them to win several medals from the International Physics Olympiad and the European Olympiad; three times they were members of the Slovak team that participated in the international round of the Experimental Physics Olympiad. The ladies, teacher Jana Plichtová from the Gymnasium at Alejová Street 1 in Košice, and teacher Iveta Štefančínová from the Gymnasium of Ján Adam Rayman in Prešov, also received the Dionýz Ilkovič Award for participating in the finals for their contribution to the development of extracurricular activities. This is not just about professional knowledge but about the all-round development of the personality of young people that the jury saw behind their work. Mrs. Plichtová, who teaches computer science at the Košice Gymnasium, says it herself: “I want to teach students how to deal with obstacles without help.” She has been teaching since 1994. Initially, they refused to admit her to pedagogic studies due to her political opinions. But the place behind the teacher’s desk awaited her anyway. From the beginning, she has been leading computer clubs and preparing children for competitions. Her pupils have succeeded in entering the biggest international competitions on multiple occasions. Jana Plichtová remembers Atlanta, Lisbon, Eindhoven, but especially Mexico City, from where they returned with a title. The third finalist, Mrs. Iveta Štefančínová teaches physics to Gymnasium students in Prešov. She’s like from a book of motivational quotes. She’s the person that these quotes want to make from you. In the most positive sense of the word. She has been teaching since 2000 and has been involved in many extracurricular activities since the beginning. Her enthusiasm is contagious: “If I didn’t enjoy it, I wouldn’t have been able to teach for so long. I am delighted that I am surrounded by young intelligent people, I enjoy physics, I enjoy the pupils.” She is rightfully proud of her students. They are able to reach high placements in the most prestigious international competitions. She argues that it’s important for students to know their qualities: “In the past we used to hear that everyone else is smart and talented except us. I am trying to convince my pupils that this is not true,” says Iveta Štefančínová. In the second year of the Dionýz Ilkovič Award, organized by the Slovak IT company PosAm, 26 quality nominations were received, from which the expert jury selected three finalists and decided on the winner. Award nominations could be sent by anyone - students, their parents, or colleagues from school. The winner and finalists received prizes totalling €6,000. The jury, among other criteria, evaluated the outcomes of extracurricular activities, their scope, or the innovative approach of the supervisor. The jury was chaired by a young Slovak scientist, the President of the international organization International Young Physicists' Tournament, Docent Martin Plesch from the Slovak Academy of Sciences. Other members of the jury are distinguished experts from Slovak and Czech universities. “Although we received a smaller number of nominations than in the first year, we were pleasantly surprised by their quality. It was a delight to get to know all the stories and to meet the exceptional people who devote a great deal of their free time to young talented people and help them grow,” says Docent Plesch. “I was very pleased that Minister Lubyová strongly emphasized the importance and the benefit of our efforts and that the Ministry of Education, Science, Research and Sports of the Slovak Republic has taken patronage over the awards,” the chairman of the jury added. The award bears the name of a prominent Slovak scientist. In 1934 Dionýz Ilkovič deduced the relation between the polarography diffusion current, the concentration of the solution, and the characteristics of the dropping mercury electrode. Today it’s known as the Ilkovič Equation. At the time he was a member of Nobel Prize winner Jaroslav Heyrovský's team. Professor Dionýz Ilkovič was not only a prominent world-class Slovak physicist and scientist, but also a great teacher, whose style of teaching became legendary for his students and colleagues. PosAm also contributed to the creation of the award. “Many of the teachers, but also the non-pedagogues, who are engaged in extracurricular activities at elementary and secondary schools, have dedicated their lives to the transfer of knowledge to young people because they believe that they can grow into future scientists and prominent personalities. 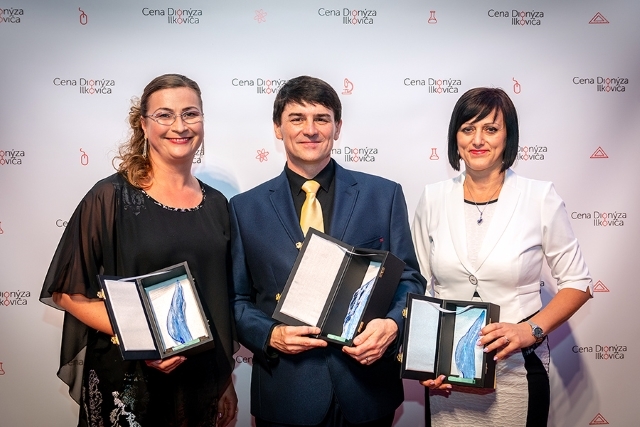 The Dionýz Ilkovič Award was created as a thanks, a tribute, and encouragement to these people,” explains Marián Marek, General Director of the company. “I have a very good feeling that our intention is successfully coming to fruition, which I personally experienced at yesterday’s award ceremony” he added.